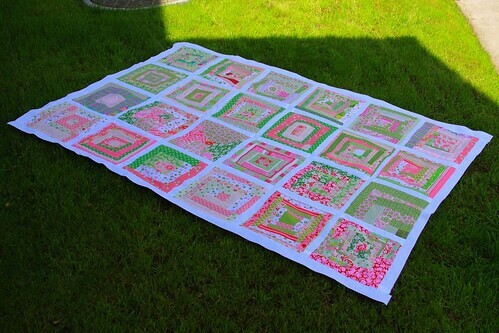 I finished the quilt top from my Cottage Quilting Bee blocks. Right now it measures 55 x 80, but of course once I quilt it and bind it, it will shrink up. It is really sunny today so the pictures did not turn out the way I want them to, but I wanted to take pictures today and post about them since we are going away for a long weekend ( YAY ). I saved some of the blocks for the back of the quilt and I have an idea of what I am going to do for the back. I bought a bunch of pink Kona Cotton and I am going to try using that on the back, but I might not like it. Thanks everyone for your gorgeous blocks, I am really enjoying them all. Pretty soon they will be keeping me warm (even though summer is almost here). This turned out very cute! I can hardly breath , I love that so much, those are my favorite colors too, excuse me while I wipe the droll off the keyboard!! It looks so awesome! I love it. It's so fun to see it all come together! Oh, it's wonderful! I love the colors. Enjoy your weekend away! Fun! It is nice to know that Sunny SoCal will cause major blow-out on pictures, but it gives it almost a stained-glass feel, so it works! Have a fun weekend! your quilt looks SOOOO GREAT!! it's getting me excited for my month! I love the picture of it hanging up in the sun. It looks GREAT! This makes me so happy that this bee is happening. Woweee! It looks fantastic and gives me such a great feeling to think I contributed to it! Love it! The white sashing is perfect. This is so much fun! This is really inspiring-- I see so many quilting bees in progress (I'm in 2!) but haven't seen too many finished projects. I love it! What a gorgeous quilt - it turned out so beautiful. Be sure to post more pictures of the back when you return from your long-weekend. And have a good time! Stunning! I am in love with those colors! Not only is this a beautiful quilt in the making....this shot is absolutely gorgeous! Darci, it's amazing. I love how everything works together too, which I always worry about. I could stare at it for hours!!! oh my goodness, this is gorgeous. Love this color and the bright colors! Very cute! 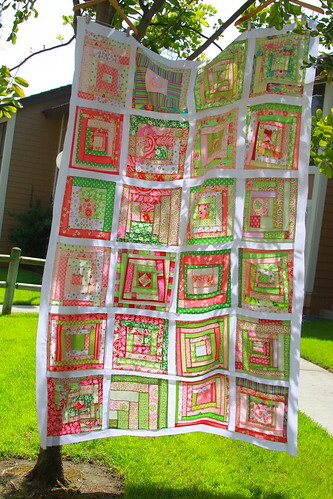 I LOVE this quilt...It is SOOOOO Pretty! What do you do with all of your quilts? That is so cute, I just love the colors!